Is the heater vent in your Scout II stuck in the on or off position? We have brand new cables to fix that problem. This is a factory replacement part. Makes opening and closing the air door on the heater box as smooth and easy as cutting butter! No more overheating in the summer or freezing in the winter! 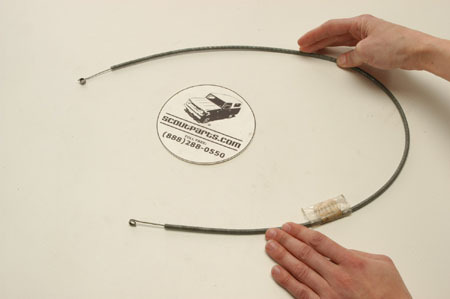 This cable is 33 3/4" from eye to eye, and has 2 5/8" travel. This will work for other applications as long as it is the same length or longer, and has the same travel or longer than the original. This also possibly may be retrofit to D, C, B, A, L, R, S, and Metro-series trucks.